In a recent post I told the origins of the electrical industry, and why AC won out over DC as the primary standard for electrical generation and transmission. Now I want to say a few words about the significance of electricity—why it was such a revolution. Sources: Where do we find usable energy in nature, and how do we harness it? Storage: Once we have it, can we keep it around in a convenient, accessible form? Transmission: How do we get it from where we have it to where we need it? Application: How do we actually put it to use? Sources and applications are fundamental; storage and transmission allow us to separate the source from the application in time and space. 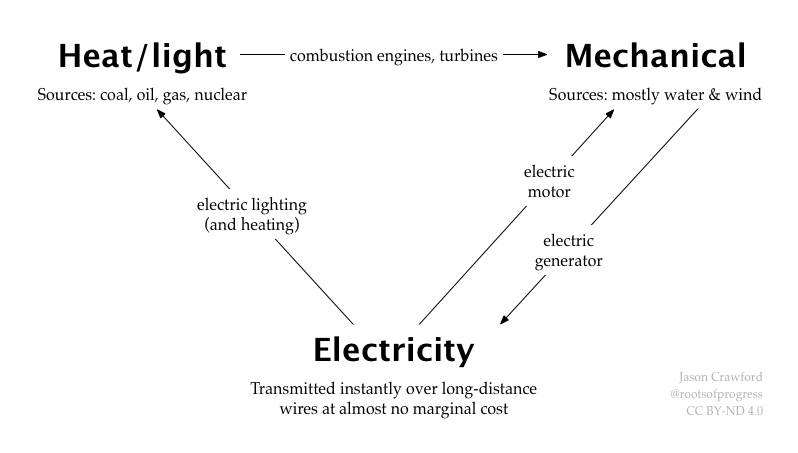 The history of energy is one of progressively better solutions to these basic problems: more abundant and reliable energy sources; smaller and lighter storage mechanisms; faster and higher-volume ways to transmit energy over distance; cleaner, safer and quieter ways to use energy; and all of the above getting cheaper and more efficient. One of the ways we solve these problems is by discovering/inventing ways of transforming energy between different forms: kinetic, thermal, electrical, etc. Indeed, the energy revolution was kicked off when the first such transformation was invented. These transformations will become especially significant when we look at electricity. Now, let’s look at the major developments in energy using this framework. Before the Industrial Revolution, humans worked with only two forms of energy. Mechanical power and locomotion came from harnessing the natural motion of wind and water, and the muscle power of animals (including, of course, humans!) Pre-industrial technology was capable of capturing kinetic energy and redirecting it or multiplying its force via simple machines such as gears and pulleys: wind and water mills put these abilities to use to grind wheat, saw wood, etc. But we had no means of transforming kinetic energy into other forms, such as heat or light. Further, mechanical energy cannot be stored in any practical way, and it can only be transmitted via belts or chains, which only work over very short distances (say, within a building). With no practical storage or transmission, mechanical power had to be applied when and where it was found. Water mills have to be on the river; windmills only turn when the wind blows. And the sources were limited: there is almost no way to increase the power of a river, or to gather more wind. Light and heat, during this time, came from burning natural fuels, such as wood, coal, or fats and oils from animals or plants (think of candles made from tallow or beeswax, or lamps lit by sperm whale oil). Compared to mechanical power, fuel power had many advantages. It could be collected via foresting, mining, etc. : biological sources quickly dwindled (as England was deforested and sperm whales were hunted nearly to extinction), but coal was abundant enough that in the 1700s it was limited only by the capital to mine it and the technology to do so efficiently. Fuel, once collected, could be stored in containers, such as bins or tanks, and it could be transported like any other physical good. So for light and heat, we were better off than for mechanical power: we had abundant sources of fuel, and with the ability to store and transmit it, we could use it when and where we wanted. The one thing we couldn’t do with fuel was transform it into any other form—particularly, into mechanical energy. This is precisely what the steam engine made possible, and why steam inaugurated the energy revolution—and indeed, the Industrial Revolution. By allowing heat to be turned into motion, the steam engine connected these two forms of energy, and brought all of the advantages of fuel energy to applications that required mechanical power. If we had discovered a way to capture the wind in a box, or to make rivers run uphill, we would have achieved less than what was achieved by steam power. With steam, mechanical energy was now abundant, reliable, and ready for use at any time or place of our choosing. The second major phase of the energy industry was the oil and gas revolution. This did not involve new ways of transforming energy. Primarily, it was a new source of energy, a new type of fuel, which previously had been minor, even ignored, until the right technology and capital came along to collect and refine it. The new fuel also had improved applications. Kerosene burned cleanly, with a good light and little smell compared to alternatives; it was thus higher quality than animal-fat candles, and more abundant and sustainable than sperm whale oil. Later, with the advent of the internal combustion engine, gasoline gained a massively important new application in transportation. So oil & gas represented a vastly expanded source of energy with improved transportation and applications. But again, we still had the same basic forms of energy—kinetic and thermal—and only one method to convert between them, which only worked in one direction. Electricity was a new form of energy, different from thermal and from kinetic. It’s not a new source of energy—for the most part, we generate electricity by harnessing motion to turn a generator: either natural motion (as from a waterfall) or motion generated from fuel energy (typically using a steam turbine). Instead, the electrical revolution is about three things. First, it is a new set of applications, including the light bulb and the electric motor. Both are cleaner, quieter, and safer than the alternatives. Electric lighting was cleaner and safer than burning oil or gas in the home, and electric motors were far cleaner, safer and quieter than combustion engines. Think of all the appliances you run in your home, from the vacuum cleaner to the refrigerator, and now imagine if each of those devices had an engine that burned fuel—they would be as noisy and dirty as a gas-powered lawnmower. Plus, burning any kind of fuel indoors carries a risk of fire. Second, it is an amazing new form of transmission. With the invention of high-voltage AC power lines, we had a way of moving power instantly over many miles, at almost zero marginal cost. Oil, as a liquid, was easier to move than coal, a solid, because it could be pumped; gas was even easier to move than oil because it only had to be pressurized; but all of these are still just different forms of matter that need to be physically transported. With electricity, we slipped the bonds of physical matter completely and discovered how to transmit energy itself directly via electromagnetic fields. Throughout all the steam and oil revolutions, we could only transform heat into motion. There was no way for a source of motion, such as a river, to be used for heat or light. Electricity changed this. Since the generator turns motion into electricity, and electricity can be turned into heat/light or back into motion, any form of energy can now be turned into any other. The result was that in 1895, when a new company went to harness the great power of Niagara Falls, they scrapped the plan to build a series of mills that could only provide one type of power (mechanical) in one location. Instead, they built a hydroelectric power plant that provided electric light to Buffalo, NY, twenty-six miles away. This is why I say that electricity completed the energy revolution. It literally completed the above diagram, and by doing so it allowed any source of energy to be used for almost any purpose. Further, by allowing power to be transmitted over long distances, it allowed a source in any location to be applied in any other. In short, electricity decoupled the generation of power from its application. This gives us maximum flexibility and maximum convenience. A waterfall at Niagara can provide lights in Buffalo; oil can be burned far away from our homes and still provide clean, safe light and heat inside them. With electricity, we finally conquered the challenges of harnessing power, transmitting it, and applying it, cleanly and safely, to anything we wanted. In this sense, electricity is the universal energy.